St. Colman’s Society for Catholic Liturgy is pleased to announce that His Eminence Raymond Leo Cardinal Burke will open the Fota IX International Liturgy Conference to be held in Cork, Ireland, July 9-11, 2016, and deliver the keynote address. The Society is also pleased to announce that Professor William Mahrt of Stanford University (and NLM’s publisher) will join the panel of speakers and deliver a paper. 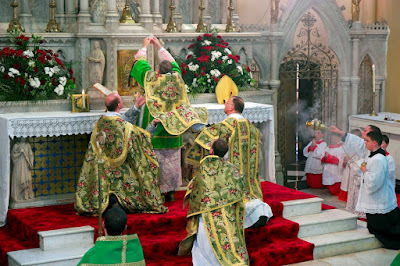 Cardinal Burke celebrating Mass at last year’s Fota conference.